The ACC picture became a little bit clearer this weekend. How about UNC? I thought Syracuse played horribly. The attack never really got its passing game to be consistent, although we saw some flashes. Randy Staats looked a little rusty and he and Dylan Donahue missed the cage from point blank several times in the first half. and Bobby Wardwell had a very challenging first half in net before being pulled for Warren Hill. By the way, Hill is no scrub; he is the starting goalie for the Iroquois Nationals and was a stud for Onondaga Community College where he won two NJCAA National Titles. As for UNC, Kieran Burke played phenomenally in net. He made multiple saves from close range and killed the Orange attack’s confidence in the first period. Luke Goldstock leads the Tar Heels in scoring, being aided by the excellent feeding abilities of Jimmy Bitter and Joey Sankey. Syracuse never led in the game, and it was a disappointing performance all around. North Carolina’s win over Syracuse means that SU will take the #3 seed in the ACCT. Next week Carolina and Notre Dame play for the #1/2 seed. The #4 seed will go to Duke after downing Virginia on Sunday in dominant fashion. The ACC is easily the best conference in college lacrosse and if you are not watching that conference tournament, you are missing out on some of the best college lacrosse there is. If this ends up being the case, Brown, Harvard, and Dartmouth would find themselves on the outside looking in. Notre Dame – The Irish beat Marquette this weekend will take on UNC in a huge ACC matchup next week. No reason to move Notre Dame out of that top spot. North Carolina – The Tar Heels have beaten Denver, Duke, Virginia, and now Syracuse. That attack is legit, and they can rind better than any other attack line I have seen. Maryland – Yes, I know the Terps took down UNC a few weeks ago, but I feel like the Tar Heels are playing better than Maryland at this point in the season. Maryland is 10-1 with a curious, early season loss to Yale. Last week UMD beat Loyola and Rutgers. Denver – Denver destroyed St. John’s this past week. The Pioneers still have Providence and Marquette on the schedule, both should be easy wins. Syracuse – The Orange now have two losses, but losing to Notre Dame and UNC is just part of how life goes in the ACC. There may be a goalie battle brewing at Syracuse, but I would expect Wardwell to get the start against Hobart this week and it should be a nice confidence booster. The attack needs to get itself together and put a higher percentage of shots on goal than it has the last three weeks. Defensively SU had an ok game against UNC but the long poles did not look great; a lot of communication issues plagued the Orange in its loss to the Tar Heels. Duke – After a win over UVA this weekend, Duke sealed up the #4 seed in the ACCT. Duke looked excellent in its win over the Cavaliers, but I doubt this team will be able to take down UNC or UND, whichever ends up as the #1 seed, but it is the ACC, so who knows. Yale – Brown fell to the Bulldogs this week 16-10. Even with a loss to Harvard two weeks from now, wins over Brown and Penn will put Yale into the Ivy League Tournament. This is a team that could win a game or two in the NCAA Tournament. Virginia – Matt Barrett is one of the best goalies in division I lacrosse. The Cavs have a big game against Duke this upcoming weekend, then Georgetown, and a battle against a weak Penn team in the ACC Showcase Game. Even if UVA loses to Duke and Georgetown, I think UVA makes the NCAA Tournament. Albany – Albany went 2-1 in the last two weeks, beating Vermont and Binghamton and losing to Syracuse. Lyle Thompson and Connor Fields are very dangerous attackmen and can lead this team to a first round win in the NCAAT. Cornell – The Big Red’s three losses have come against Syracuse, Virginia and Harvard. Cornell has two top ten wins over Albany and Yale. Two more Ivy League matchups remain on the schedule against Brown and Princeton. Cornell should get into the NCAAT even if it doesn’t win the Ivy League, but this team has some big weak spots, especially on defense. Ohio State – The Buckeyes had a slow start against Michigan, but revved it up in the second period on the way to beating the Wolverines. I have no idea how this team lost to Detroit or Marquette, and putting up zero goals against Notre Dame was not a good look. Nevertheless, OSU still beat Denver and has a huge Big Ten matchup against Maryland this week. Towson – The Tigers have four straight wins. The win over Georgetown early in the season will help this team if they find themselves on the bubble. However, I imagine Towson will be able to win the Colonial League. Brown – The Bears lost to Yale 10-16 on Saturday. There is still a chance that Brown misses out on the conference tournament and the NCAA Tournament. Marquette – The Golden Eagles are 10-3 overall and 3-1 in the Big East with Denver still on the schedule. Other than the game against the Pioneers, Marquette also has a game against Duke. These are two massive opportunities, but I doubt Marquette can take down either. The Eagles are a bubble team and are 12th in RPI and 29th in SOS. As for quality wins, there is just one, a 10-9 win over Ohio State. Marquette may be able to make one of the NCAAT play-in games but otherwise I think they are out right now. Georgetown – Look, the Hoyas do not have a big win over any school. Its losses are all quality losses, however. The Hoyas have a big opportunity when they travel to UVA this week. Georgetown is likely to get the #2 seed in the Big East Tourney and play Marquette. Lose that game and Georgetown is likely out. Navy – The midshipmen took down Army last week. Currently Navy stands atop the Patriot League standings and will be either the #1 or #2 seed in the conference tournament, depending on whether or not Loyola beats Bucknell this week. Navy is idle until the Patriot League Tournament on the weekend of the April 24. Princeton – The Tigers don’t fall out of my poll, simply because there is no other team that is good enough to make it in. Princeton lost to Lehigh by one goal and beat Dartmouth last week. Harvard and Cornell remain on the schedule but the Tigers should make it in to the Ivy Tournament. Stony Brook – SBU had five straight wins before falling to Lehigh on Sunday. That loss probably kills any chance the Seawolves have of gaining an at-large bid, that of course barring an enormous upset of Duke this week. Colgate – The ‘Gate still have chances to improve its resume against Army and Syracuse over the next two weeks. IN terms of the Patriot League Tourney, Colgate is currently 5-2 in-conference and should make it in. Hobart – The Statesmen sit at 7-3 and have a chance to make some noise in college lacrosse when they take on Syracuse on Tuesday. Unbeknownst to many, this is actually a big rivalry game as these two teams play for the Kraus-Simmons Trophy. 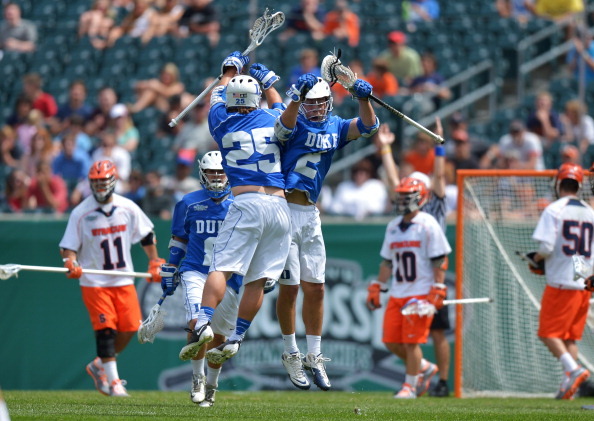 In 2013, the year in which Syracuse fell to Duke in the National Championship, Hobart actually beat the Orange 13-12. Don’t discount this game.